Former President of the United States Bill Clinton, former British Prime Minister Tony Blair and former Irish Taoiseach, Bertie Ahern - all of whom are honorary graduates of Queen's - were among the architects of the Good Friday Agreement who attended a special celebration event on Tuesday 10 April at the University to mark the twentieth anniversary of the Agreement. 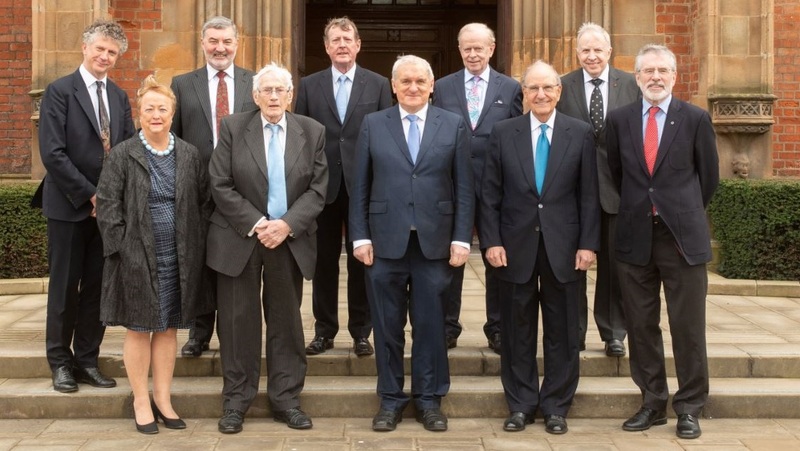 The event, ‘Building Peace: 20 years on from the Belfast/Good Friday Agreement’, was organised by the Senator George J. Mitchell Institute for Global Peace, Security and Justice at Queen’s University. Held in the Sir William Whitla Hall it was the only such gathering to bring together so many of the key influencers - local, national and international - on the Good Friday Agreement to marks its milestone anniversary. President Clinton, who received an enthusiastic welcome when he joined particpants on stage, used the occasion to urge local politicians to “inspire the world” again, describing the Agreement as a ‘work of genius that is applicable if you care at all about preserving democracy’. He said: “These people gave you a gift..the people who lost loved ones and bore scars, the women’s groups, the kids, everybody, they gave you a gift. Make the most of it. It’s a precious gift." The Agreement, signed by Tony Blair and Bertie Ahern on behalf of both governments was brokered by former US Special Envoy for Northern Ireland, Senator George J. Mitchell. Addressing a packed Whitla Hall, Senator Mitchell said: “Achieving and sustaining those lofty goals (of the Good Friday Agreement) would require of future leaders, the vision and courage that the leaders of Northern Ireland in 1998 demonstrated. I hope that the current leaders of Northern Ireland, of Ireland, of the United Kingdom and of the European Union, as they today reflect on their responsibilities, will look back 20 years to what their predecessors did. “The current problems in Northern Ireland are difficult and they are serious, and they must be resolved, but at the same time we should not hold Northern Ireland to a higher standard than applied to everyone else in the world. Senator Mitchell then chaired a panel Tony Blair, Bertie Ahern and Bill Clinton who discussed the significance of the Good Friday Agreement and the challenges that still had to be overcome. Speaking ahead of the event, Queen’s Acting Vice-Chancellor, Professor James McElnay, said: “We are honoured and delighted to welcome President Clinton to Queen’s University to mark the twentieth anniversary of the Belfast/Good Friday Agreement. Queen’s Pro-Vice-Chancellor for Internationalisation and Engagement, Professor Richard English, said: “The event at Queen’s which is gathering together all the key influencers from the Belfast/Good Friday Agreement period promises to not only reflect upon the achievements of twenty years ago, but to look at how far we have come and indeed how far we have to travel. Extracts from the historic Good Friday Agreement reunion at Queen's University can be viewed here. For more on the work of the Senator George J. Mitchell Institute for Global Peace, Security and Justice at Queen’s University Belfast email mitchell.institute@qub.ac.uk or telephone +44 (0)28 9097 3609/1346. Media inquiries to Claire Kelly, Queen’s University Communications Manager, tel: +44 (0)28 9097 5391.